Item #17562 Art Asylum-Mirror Mirror Dr.McCoy Action Figure $19.95 ea. In Stock This exclusive New Force/Art Asylum 7" Dr. McCoy-Mirror Mirror action figure is mint on a near mint sealed card,this figure comes also in a white box for storage, this figure has Dr.McCoy in his Mirror Universe uniform from the classic tv series he also comes with a tricorder, phaser, communicator and a dagger, real scan technology was used in making these figures, fully articulated. Item #ST-40TH-PAT Classic Star Trek 40th. Anniversary Patch $12.95 ea. In Stock This officially licensed Classic Star Trek 40th. Anniversary patch if full color is about 4 1/4" tall from top of delta shield to the bottom and is 3 3/4" wide from saucer section to white border, fully embroidered, patch can be iron on or sown. Item #CC-96609 Corgi-Star Trek TNG-U.S.S. Enterprise NCC-1701-D Raw Die-Cast Limited Edition Toy Ship $44.95 ea. In Stock This new Corgi-Star Trek The Next Generation, U.S.S. Enterprise NCC-1701-D raw die-cast toy ship is mint in near mint box, limited edition of only 7,510 pcs. display base lights up, comes with 4 AAA batteries, ship is about 10" long by about 7" wide from side to side of the saucer section, each ship is very detailed, comes with numbered certificate, comes in 40th. Anniversary Star Trek packaging. Item #ST-TS-1705 Classic Star Trek 40th. 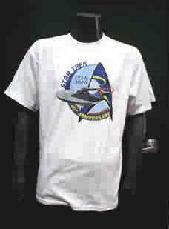 Anniversary T-Shirt $15.00 ea. 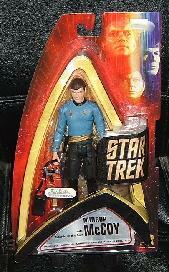 In Stock This officially licensed Star Trek 40th. Anniversary logo t-shirt is 100% pre-shunk cotton, one sided and comes in white only, this shirt shows the classic Enterprise warping around the earth, coming through a delta shield and also has the original Star Trek logo and the yrs. 1966-2006 at the top and 40th. Anniversary at the bottom. Item #ST-ROM-PAT $6.95 In Stock (ONLY HAVE 1) Romulan logo patch is full color, fully embroidered is about 4" wide by 2 1/4" tall, can be sown on or ironed on. Item #ST-ENT-PAT-1 $5.95 In Stock (ONLY HAVE 1) This classic Star Trek U.S.S. Enterprise NCC-1701 Enterprise patch is full color, fully embroidered is about 3 3/4" long by 2" tall, this patch can only be sown on, ship is in silver with red highlights. Item #17757 Art Asylum/Diamond Select Star Trek II-The Wrath of Khan Type 2 Phaser Electronic Toy $41.95 ea. In Stock This new Art Asylum/Diamond Select Star Trek II-The Wrath of Khan type 2 phaser is in 1:1 scale and is in a near mint sealed box, this 2 in 1 design, has lights and sound as seen & heard in Star Trek II, removable type 1 phaser separates from type 2 with unique sound effects, lighted power setting indicators, multiple phaser settings include: heat, stun, kill, disintegrate & overload. Item #CC-96607 Corgi Limited Edition 40th. Anniversary Classic Star Trek U.S.S. Enterprise Raw Die-Cast Ship $44.95 ea. In Stock This new Corgi raw (un-painted) die-cast limited edition, Star Trek 40th. Anniversary U.S.S. Enterprise NCC-1701 has a display base that is about 5" in diameter, lights up and pulsates, ship is about 8" long by 3" wide, the bridge and the end of the engine necelles are clear plastic, ship can also be displayed with out the light up base, batteries are included, limited to 7,500 pcs.